While Father’s don’t get as much press as mom’s, today we have a chance to, at least, make this day special for the Dads. Make some social media noise. 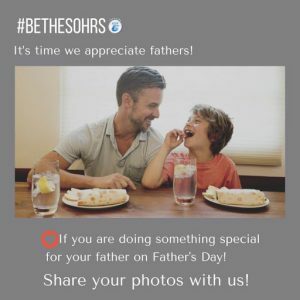 Today’s “#BeTheSohrs” focus is a Father’s Day Tribute. “Fathers were a God idea. Let’s show “the world”, how Christians celebrate their dads on Father’s Day. Or (Heart) if you are doing something special for your father on Father’s Day!